Vice President Pence hosted a group of schoolchildren Monday afternoon at his residence, the Naval Observatory, to view the "Great American Solar Eclipse"-- the first total eclipse in the United States in nearly 100 years. While the sun was not totally covered by the moon's shadow in Washington, D.C., Pence and the visiting students were able to view area's 81-percent eclipse from the 1890s-era observatory. 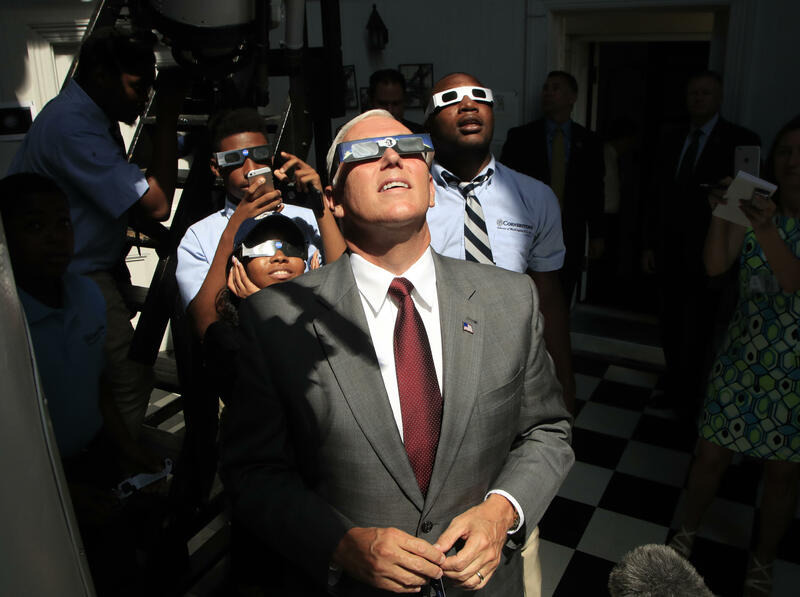 "We're going to go and look to the skies, we're going to see something that Americans haven't been able to see since 1918," Pence told the students from Cornerstone Schools, a private Christian school in D.C. "It is extraordinary." The vice president and the students viewed the eclipse through a filter on the observatory's telescope, which is more than 100 years old. Students also used protective eclipse glasses to safely view the cosmic event. "I want to encourage you: be inspired by what you see today," Pence said to the students, noting that some of them could grow up to be astronauts themselves. President Trump and First Lady Melania Trump viewed the eclipse from the Truman balcony, the second-floor balcony overlooking the South Lawn of the White House.